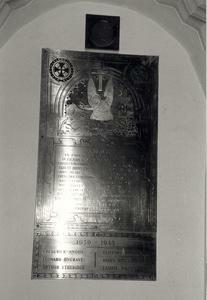 Brass plaque, bordered by an intricate design, within which is a Latin cross and depiction of Peace overlooking a dead soldier on a battlefield. Two ringed Patté crosses are situated in the top corners of the plaque. Second plaque honouring those who fell in the Second World War was added below. A "Death Plaque" for Cyril Ambrose Walton is positioned above the brass plaque.